Does the Phone Soap (UV light sanitizer for phones) really work? My Phone Soap experiments have moved to my new more user-friendly website. Check it out! www.DrAnniesExperiments.com. I was so excited to test and review the Phone Soap! It is a UV light box used to kill the germs on cell phones. Since cell phones are delicate, you can't just wipe them off with chlorine bleach every day (unless you have a LifeProof case on your phone like me). And lets face it, a lot of us use our phones while we are on the toilet, AND also while we are eating. So it would be nice to have a good way to kill the germs on our phones. I received the Phone Soap directly from the company in June 2016. They sent it to me for free to test. I didn't get any other compensation from the company except for that free Phone Soap. It is simple to use. There is no on or off switch. You just put the phone in, shut the lid, and the light comes on. When the light shuts off, the phone is done. There is a UV light on the top and bottom of the Phone Soap "tanning bed". The Phone Soap model that I received runs for about 10 minutes to kill germs. Most models only run for 4 minutes. 2 Is the Phone Soap capable of killing germs? 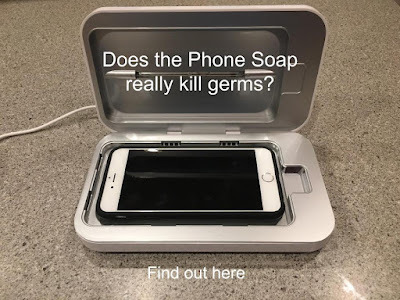 3 How well does the Phone Soap kill germs on a phone? 4 Does the Phone Soap kill germs on the SIDES of the phone? 5 Does wiping off your phone before using the Phone Soap help? 6 Does wiping off your phone with 3% hydrogen peroxide help get rid of germs? 7 Does wiping off your phone with Isopropyl alcohol (rubbing alcohol) help get rid of germs? 9 My thoughts on being "too clean". If you are new to my website, let me tell you a little about myself. My name is Annie Pryor. I have a Ph.D. in biochemistry from The Ohio State University. After a few years working in a research lab, I "retired" to be a stay-at-home mom. When my first baby got a terrible stomach virus that required a trip to the ER, I decided to research the subject and created this website dedicated to reducing the prevalence of the stomach "flu" in the world. My 3 little kids keep me busy, but I still get a hankering to do experiments now and then. I've tested cleaning products, hand sanitizers, produce washing techniques, essential oils, Norwex Cloths, SteriPens, laundry, lunch box coldness, the Phone Soap, sponges, and even sunlight. I also happen to be the inventor of a really useful drying rack. I invented it because I needed a convenient place next to the kitchen sink to hang baby bibs up to dry between meals. It is also perfect for drying sports water bottles, dish cloths, food-storage bags, cleaning cloths and many other items. I have a shorter drying rack (12.5 inches tall) and a taller 15 inch rack. The Mommy Genius® Drying Rack s are manufactured in the USA and are available on Amazon. If you would like to be informed when new experimental results are posted, please like my Facebook page. I am also very proud of my daughter, Katie Scarlett. At age 8, she has written, illustrated, and published the first 3 books in a delightful series! Princess Katie and the Fairy Tea Party , Princess Katie and the Mermaid Lagoon , and Princess Katie and the Kitty Club are available on amazon. The stories are so sweet and teach about kindness, forgiveness, including others, and doing the right thing. I think every little girl would love them! Please consider buying them for a little girl that you love. Katie gets about a $2 royalty from amazon for each book sold that is getting deposited into her college savings account. Is the Phone Soap capable of killing germs? I sucked out some of the germy iceberg lettuce water and put it onto a small plastic lid from a box of Gerber baby food. Then I let the germ water on the lid dry overnight. When it was dry, I dipped a sterile swab in sterile water and swabbed the lid. I rubbed that swab onto an agar plate. This would be the dirty control plate which should grow lots of bacteria. I also dipped a sterile swab into sterile water and rubbed that swab onto an agar plate. This would be the negative control. Nothing should grow on that plate. Then I put the lid into the Phone Soap. I closed the lid and the UV light ran for 10 minutes. When the Phone soap finished, I dipped a sterile swab into sterile water, swabbed the lid again, and rubbed the swab onto another agar plate. I incubated the plates for 24 hours in my warm (about 90 degrees F) incubator. (I have details about this incubator on this page.) Here are the results. As you can see, the Phone Soap killed the heck out of the bacteria on that lid. If you are not experienced at looking at agar plates, let me explain what we are seeing. The white dots you see on the plates are piles (or colonies) of millions of bacteria. Sometimes you see individual colonies, and sometimes you see smears because there was so much bacteria to start with that they all blended together. The dirty control plate in this experiment is just covered with bacteria. It is hard to see individual colonies, and it looks like a smear. Since the lid is clear, I wondered if getting the UV light from both sides increased the amount of bacteria killed. So, I repeated the experiment with the lettuce water and a salsa jar lid. Again the Phone Soap did a great job. This time you can see some individual colonies. There are hardly any colonies on the plate from the lid after the Phone Soap compared to the number of colonies on the plate from the lid before the Phone Soap. So, Phone Soap is telling the truth that their product is capable of killing germs. DISCLAIMER. I need to remind everyone that the agar plates that I use do not grow every type of bacteria. Agar plates also do not grow viruses. So, even if nothing grows on some of my agar plates, it doesn't necessarily mean that no microorganisms whatsoever were present. How well does the Phone Soap kill germs on a phone? For these experiments, I used real people's real phones. I did not artificially contaminate the phones at all. These are just real phones with real germs. All of the phones that I tested had cases on them. No one I know uses a phone without a case (except my sister and she lives far away) so I did not get a chance to test dirty phones without cases. I drop my phone on the floor every single day, so I have to keep it in the case. First, I dipped a sterile swab in sterile water and swabbed the phone. I rubbed the swab on the front, back, and sides of the phone. Then I rubbed the swab onto an agar plate. This would be the dirty "before Phone Soap" control. Then I put the phone in the Phone Soap and let it run for 10 minutes. After the phone was "clean", I put on clean gloves and carefully picked up the phone. I dipped a sterile swab into sterile water and swabbed the front, back, and sides of the phone. I was careful to only hold the phone on two spots on the sides, and I did not swab those spots. I rubbed the swab onto an agar plate. The plates were incubated for 24-48 hours. Much to my surprise, I was not seeing the super clean results that I was expecting. I repeated this many more times to be sure. Looking at the design of the Phone Soap with a light at the top and bottom, I wondered if the UV light was not hitting the sides of the phones. Does the Phone Soap kill germs on the SIDES of the phone? I repeated the experiment, but this time I swabbed the top/bottom and sides of the phone separately. I swabbed the entire phone with one swab BEFORE it went into the Phone Soap for the dirty control plate. After the Phone Soap, I dipped the swab into sterile water and swabbed just the sides of the phone before I even took it out of the Phone Soap. Then I picked the phone up with a clean gloved hand and swabbed only the top and bottom of the phone with a new sterile swab. As you can see from the results, the top and bottom of the phone usually have significantly less bacteria than the sides of the phones after being in the Phone Soap. This is most likely because the UV light doesn't hit the sides of the phones. Phone Soap should consider redesigning the "tanning bed" to include lights on the sides. Does wiping off your phone before using the Phone Soap help? There are other factors that could influence how well the Phone Soap works. If there is debris, grease, or sunscreen from your face on your phone, the UV light won't kill the germs as well. Also, there are crevices in phone cases where the UV light won't penetrate. (I never swab in those crevices for these experiments because they will have germs.) So, it might be a good idea to wipe off your phone BEFORE you put it in the Phone Soap. Here is an experiment where I just wiped off the phone with a damp cotton cloth, and then put it in the Phone Soap. I apologize for not being able to find a black marker that day. I used purple which is much harder to read. The upper left plate is the dirty phone control. The upper right plate is the phone after being wiped off with a damp cotton cloth. The bottom left plate is the sides of the phone after being in the Phone Soap. The bottom right plate is the top/bottom of the phone after being in the Phone Soap. As you can see, the damp cloth didn't make a huge difference. However, I still think wiping the gunk off the phone before putting it in the Phone Soap is bound to help. Does wiping off your phone with 3% hydrogen peroxide help get rid of germs? Before I got the phone soap, and since my phone has a LifeProof case , I would always spray a tissue with 3% hydrogen peroxide and wipe off my phone. I had to use about 6 sprays on one tissue to get the phone wet enough to really kill germs. I do not know if it would be safe to use hydrogen peroxide to wipe off a phone without a case. To test how well that works, I swabbed the phones before and after wiping with the 3% hydrogen peroxide. As you can see the 3% hydrogen peroxide kills bacteria very well. However, I did need to get the phones fairly wet with the hydrogen peroxide to get results this good. Rubbing a mostly dry tissue that had a little hydrogen peroxide on it on the phone did not do well. Since hydrogen peroxide probably doesn't kill all types of harmful germs, I think wiping the phone off with hydrogen peroxide and then using the Phone Soap would be a good idea. Please remember that all types of bacteria do not grow on these agar plates, and viruses do not grow on these agar plates. So, just because an agar plate does not appear to have any bacteria growing on it, doesn't necessarily mean that there were no germs present. Does wiping off your phone with Isopropyl alcohol (rubbing alcohol) help get rid of germs? My sister wipes her iphone off with isopropyl alcohol every day, and her phone does not even have a case. I can't promise that it won't hurt your phone, but my sister doesn't think it has damaged hers, and she has done it for years. The alcohol is great for getting rid of grease and dries very fast. It will also kill some germs. Since Isopropyl alcohol doesn't kill everything, it might be a good idea to wipe the phone off with the alcohol first, and then use the Phone Soap. Here are the results when I swabbed dirty phones, wiped them off with a tissue and 70% isopropyl alcohol, and then swabbed them again. The isopropyl alcohol does pretty good. The Phone Soap is definitely capable of killing germs. However, it doesn't kill germs on the sides of the phone very well. Also, dirt, grease, and sunscreen on the phone can interfere with the germ killing. I would advice wiping the phone off with 3% hydrogen peroxide or isopropyl alcohol (if the phone has a protective case) and then using the Phone Soap. If you can't use anything else, just wipe the phone off with a damp cloth before putting it in the Phone Soap. The Phone Soap may kill germs that the hydrogen peroxide and alcohol didn't kill. Here is an article showing that UV light was somewhat effective at killing a norovirus surrogate. The Discovery Channel did a test on the Phone Soap showing how effective it is at killing germs. However, they never tested the sides of the phone. You can see their video here. Many people are confused and think that I want to kill all the germs in the world. This is not true. There is good bacteria in our bodies and our environment that is extremely important. I consider myself a "norophobe" and not a "germaphobe". I mainly detest stomach viruses and anything that will kill you. I also detest toxic chemicals. So, I don't want to waste my time using a toxic cleaning product that isn't really doing anything or isn't necessary. That is why I wanted to test these products and figure out what is best. So, I don't think you need to sterilize your entire house. It would be impossible anyway. Our bodies, produce, carpet, floors, clothing, and environment are full of germs. Most of them are harmless or even helpful. My kids come inside covered in dirt every day and snuggle with our dog. Everyone gets PLENTY of germ exposure. If you have ever taken a toddler outside to play, you know that they get dirt in their mouths, and it is pretty much impossible to keep them "too clean". However, from my schooling and research, I have learned that most nasty illnesses are spread through poop. So, I see no harm in having a clean toilet and washing hands before eating. Washing your hands before eating, keeping a relatively sterile toilet and food preparation surfaces is not going to make a dent in the total number of germs that you are exposed to every day. It will just reduce the likelihood of you coming in contact with a terrible germ.